Summary: From Cow Bridge beside Brothers Water the walk ascends via Hartsop to Hayeswater then continues to the Knott before forking on to High Street. 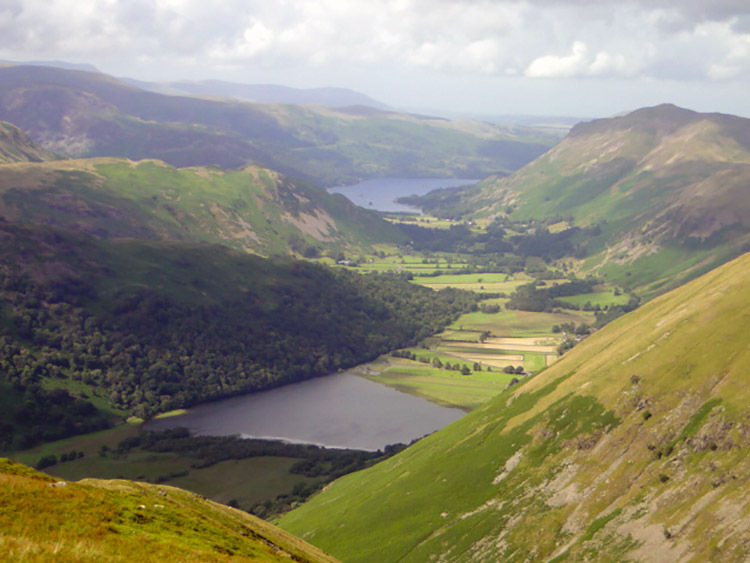 After walking along the upland street Thornthwaite Crag is reached with its huge beacon before descent is steeply made to Threshthwaite Mount before a final climb to Stony Cove Pike, then down off Caudale Moor and round Brothers Water to finish back at Cow Bridge. 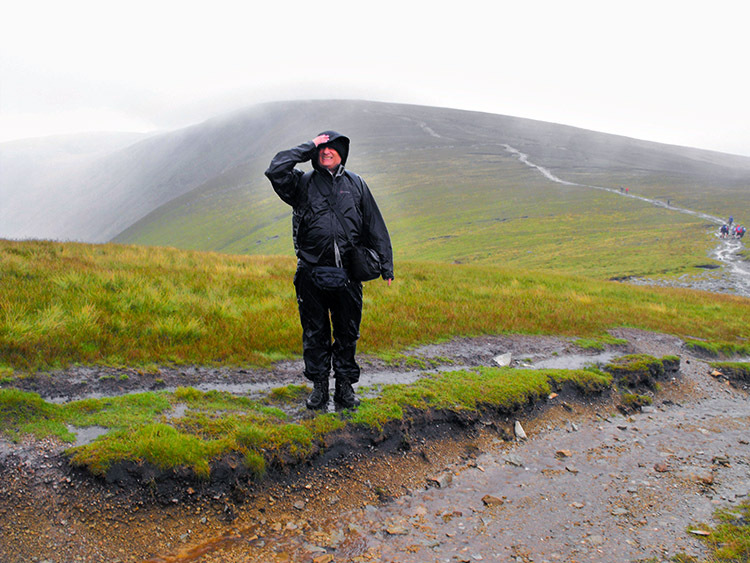 After the obedient weather we had all enjoyed during our walks on this 2009 Lake District walking trip including the spectacular sunshine on the Coledale Horseshoe 48 hours earlier we ended up on our final walk with cloud and rain. This was the last day of the break though, work the next day, so there was no stopping the remaining team members, Steve, Dave, Chris and I from taking on High Street despite what the weather was to throw at us. 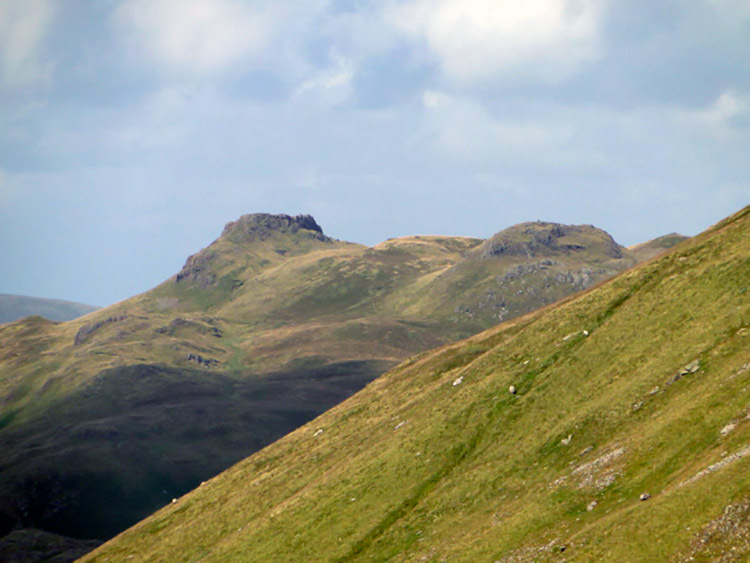 The start from Hartsop village was not too bad. It was overcast and drizzly but clouds were quite high and we could see the fells above us. We could see where we were going and with intent we left the village car park to ascend the high ground via Hayeswater Gill. Steadily climbing and taking breaks to photograph the gushing waterfalls soon took us to 200 metres of ascent to the point where Sulphury Gill tumbles into Hayeswater Gill and here we were passed by people in off road vehicles and dogs, lots of them, who were rounding up all the sheep from the fells around. They were on a mission and we were to see them later on at the end of day. For now we had cloud to meet up with. 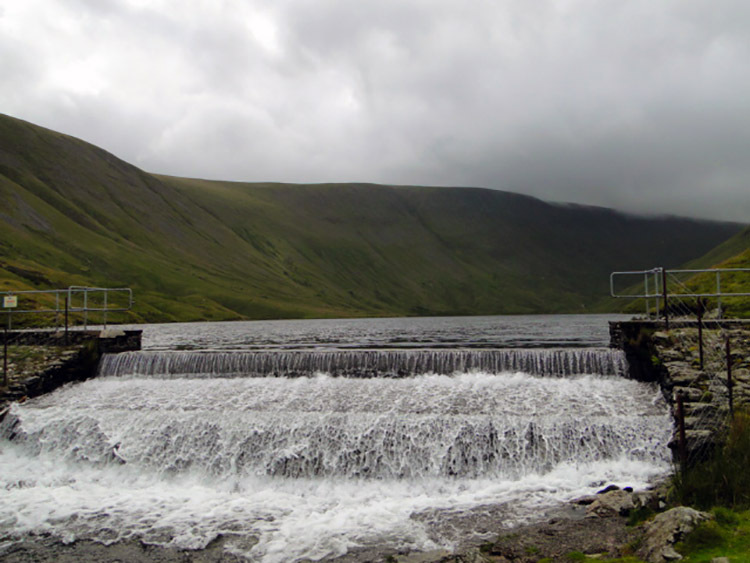 After being passed by the marauding sheep rounders we reached Hayeswater and crossed the reservoir footbridge to begin our ascent of the Knott to reach familiar ground for Steve, Dave and me, the last time 15 years previous. 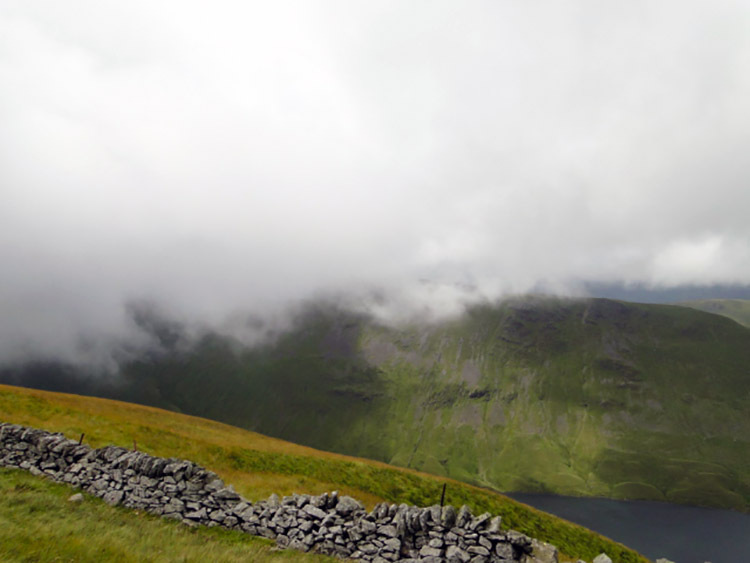 The climb from Hayeswater to our encounter with the past was not easy, a steep climb of 250 metres in a single kilometer which took the breath out of me for sure. Still, I was driven on by reaching the Knott and I soldiered on to it and back on to the Coast to Coast path! 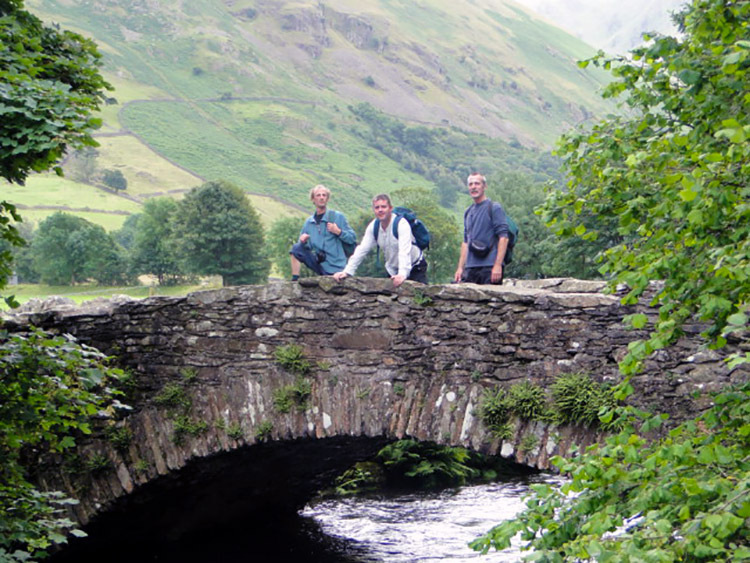 When we were all together on the path I took delight in telling Steve and Dave that they last stood on the very spot they were on now 15 years, 2 months and 16 days ago during the Shap to Patterdale section of our 1994 Coast to Coast walk on the 9th May, 1994. The weather was much better that day, a lovely sunny spring day set very fair. 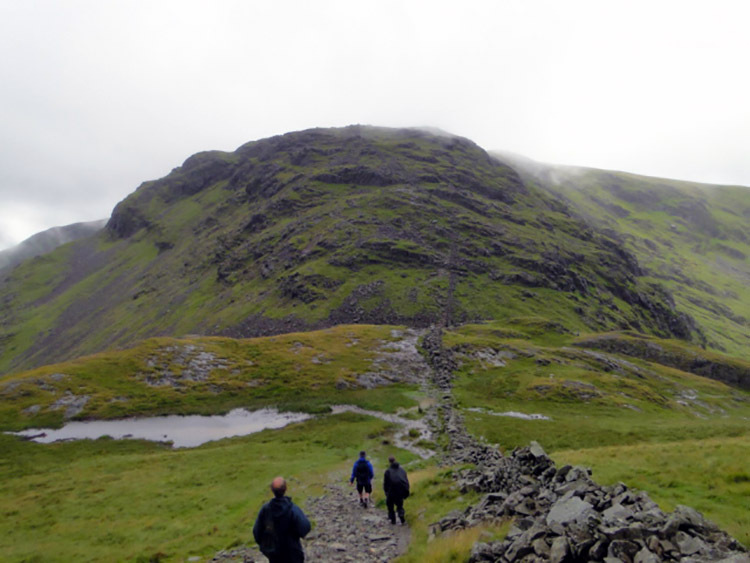 Now 15 years, 2 months, and 16 days later the cloud was ominously descending on us, and just as we were reaching the highest point of the walk, the airy plateau of High Street. 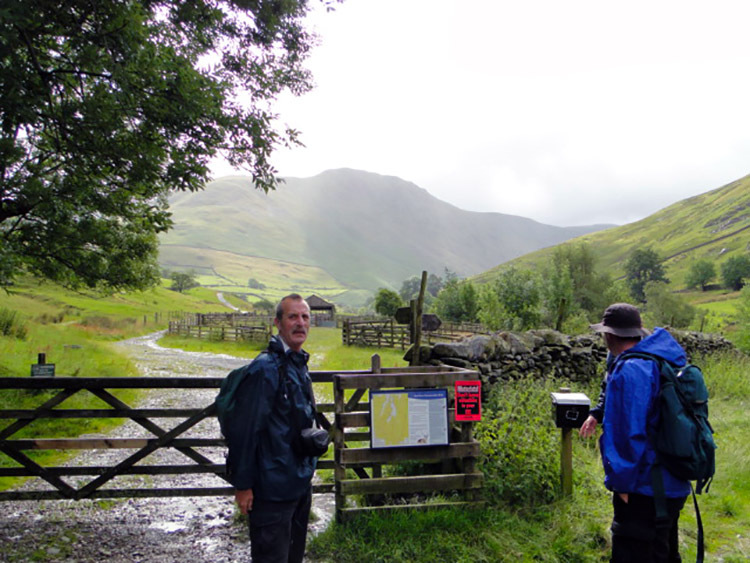 As we left our brief encounter with the Coast to Coast path and walked over the Straits of Riggindale to High Street we entered into the descending cloud and by the time we reached the northern end of High Street it was raining. The next two and a half kilometres of the walk along High Street, past Racecourse Hill and to the beacon at Thornthwaite Crag were hellish. The rain became heavy very quickly and as is on high ground hit us like darts. It was driving into us horizontally so much that we had to look down to the ground to avoid the wet missiles. At the outset we had quickly donned our full waterproof gear which protected us as best it could but we still were soaked through. Suffice to say we did not enjoy the views from High Street and so missed out on Wainwrights description of our walk which says "Proceed from the Straits of Riggindale to the summit...by following the edge of the eastern face (which has excellent views) until the Ordnance Survey column comes into sight". We followed his path precisely but we did not see any of the promised views. The cloud put paid to that. Still, in such adversity, people find humour in it and as we passed walkers in the same distress comments abounded like "lovely day", "great to be out walking" and "what a delight to be up here in such splendid weather". This type of day rounds off the experience and by the time we reached the huge beacon and nearby wall which offered us some protection we could not stop laughing about it. 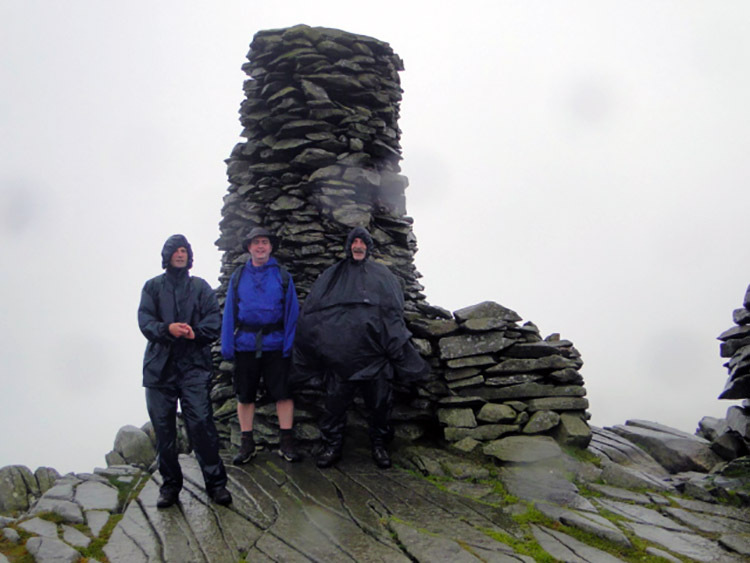 We rested in the protection of Thornthwaite Crag's Beacon for a while and as if by magic the rain subsided. Perhaps High Street did not want us to see all its secrets saving them for another time. It will have to be so. From Thornthwaite Crag we descended in a north west direction to Threshthwaite Mouth and then started climbing to Stony Cove Pike, the summit point of Caudale Moor. The ascent was fun being steep enough for some straightforward scrambling that gives us height gain quickly without the drudge of relentless climbing. It is my favourite way of climbing mountains and I enjoyed it immensely, as did Chris who scrambled up with me. Dave and Steve were not far behind and gratefully we reached the top as the sun came out which allowed us to dry off a little while taking our dinner break. I also took off my boots to wring out my socks which had got soaked on high Street. Ah, the relief of dry feet! After enjoying lunch and some lovely views of Windermere in the south from Stony Cove Pike we set off down towards John Bell's Banner which would give us access to a path off Caudale Moor via Rough Edge. On the descent in the most welcome warming sun Chris and I walked in front with Steve and Dave just behind. After a while Steve and Dave asked if we were going the right way. I reassured them we were and as I did so Chris took a little stumble which led him into a trot. the trot became a run and soon he was bounding away down the hillside and past John Bell's Banner where we should have cut off from our southerly direction to a northerly. Steve and Dave asked again and again until I took notice and halted Chris. We had descended on the wrong line by about 400 metres. Drat, I quickly checked the map and decided the course of action was to follow the contour line in a due north direction until we found the path at Rough Edge. After doing so and negotiating a few trickling drops we made our ground and regained our correct course. 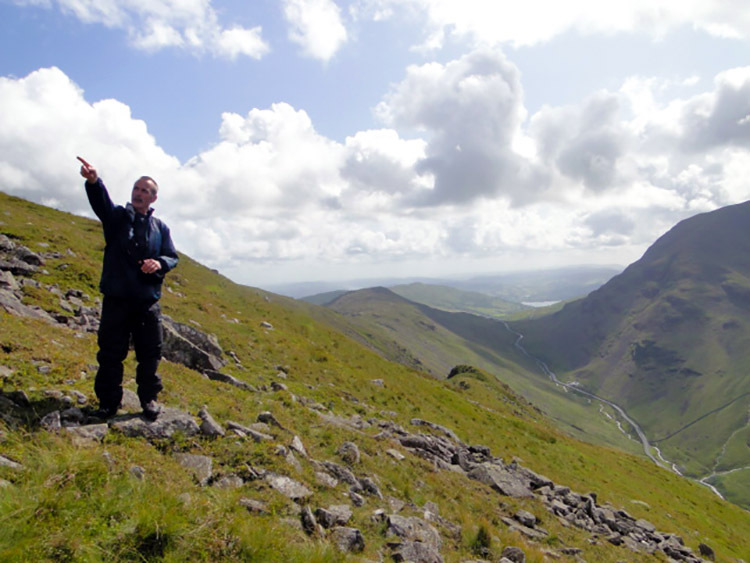 The slight detour was made and on it we enjoyed some great views down to the Kirkstone Pass. Now our attention turned to making a safe descent of Caudale Moor. The desperate weather conditions we encountered on High Street were now distant memories as the views we enjoyed on the descent of Caudale Moor were super. Brothers Water and Ullswater both captured our attention immediately ahead and over above us to the right were the distinct knobbly outlines of the Angletarn Pikes. We couldn't keep our eyes on the distant views too much though because the descent from Caudale Moor was a steep one at a 30% gradient for the final kilometer of the moor. We were always applying the brakes to stop ourselves going too fast which would have led to the inevitable tumbles; in fact I recall we all made a slight slip on the way down, none being more than an embarrassment. Finally and with relief we made the bottom and followed the road north from Caudale Bridge to Sykeside before heading west to Hartsop Hall which took us on an amble past Brothers Water. 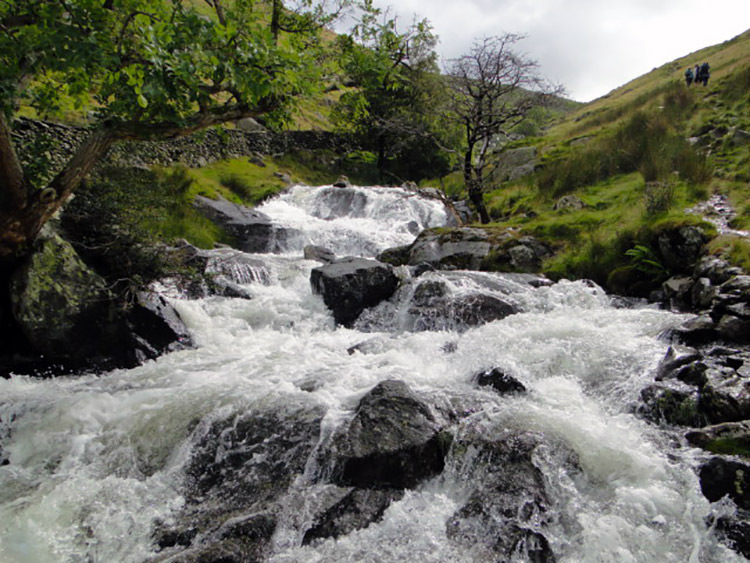 After the waterside walk we emerged at Cow Bridge which gave us access to the road back to Hartsop. After walking through the village to the car park we noticed the sheep rounders who had passed us earlier in the day with a mass of sheep in pens close by. They must have been busy, there were hundreds of sheep. For us and our final day out in the Lakes for the time being it was time for reflection. For me I thought. What a walk, a right old soaking on High Street, a lovely scramble to Stony Cove Pike then a detour followed by a steep descent. Great. 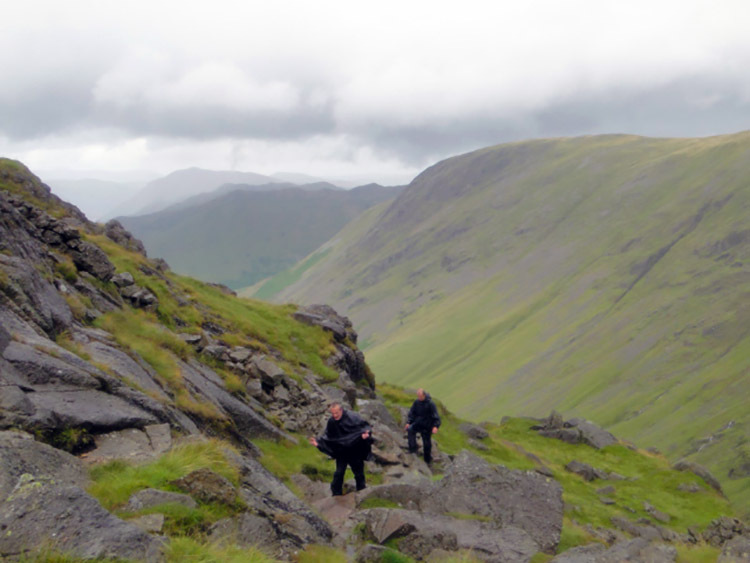 This was the final walk of the 2009 Lake District walking break. In all I did 4 splendid walks, climbed 11 new Wainwright Fells, had some great nights out in Penrith and above all enjoyed the company of Dave, Steve, Chris, Greg, Rick and Martin. Thanks guys, I can't wait until the next time.